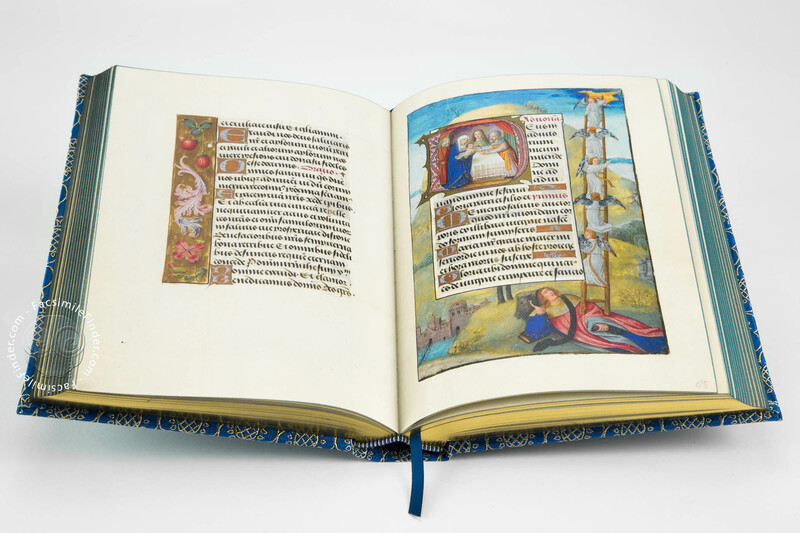 The Fitzwilliam Book of Hours, taking its name from its place of preservation, is one of the most unique examples of Flemish illumination. 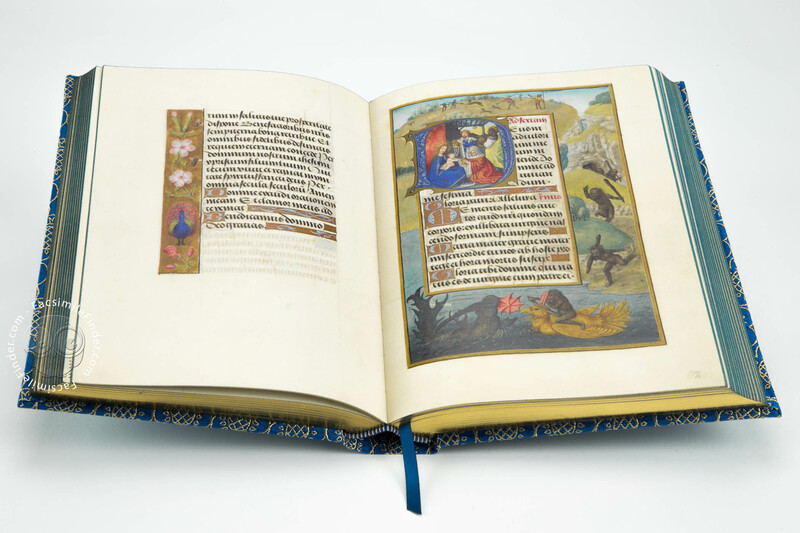 The codex was created in the first quarter of the 16h century, around 1510 in the town of Bruges – the place where Flemish art of illumination was born – and with its countless full-page miniatures and profusion of border decorations it is justly considered a beautiful example of Bruges superb production. 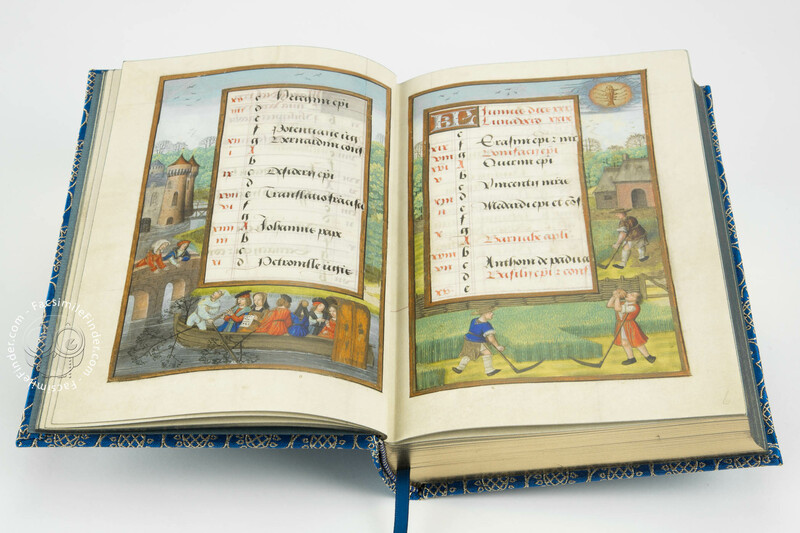 Although printed books were starting to become popular, noble patrons would prefer the illuminated manuscript, by means of which they would exhibit their taste and status. 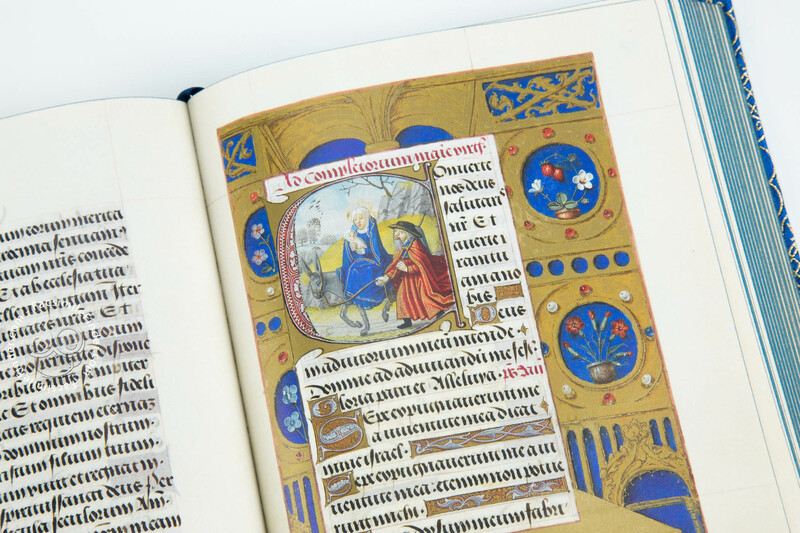 Due to this competition, manuscripts’ decorations became even more elaborate and splendid, examples of which feature in the Fitzwilliam Book of Hours. The artists make use of the traditional trompe l’oeil technique, in addition to new features such as realistic portraiture, and landscape and architecture backdrops. 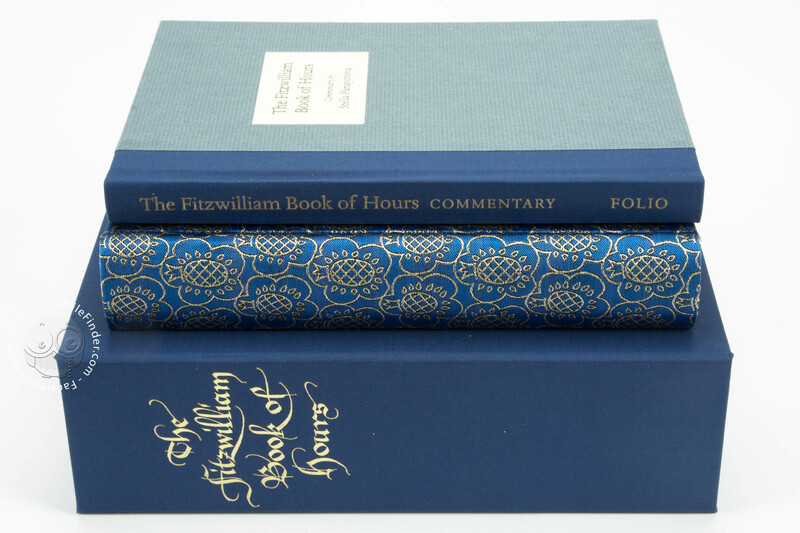 Indeed, the Fitzwilliam Book of Hours is to be considered the fruit of a remarkable collaboration under the direction of the main artist which is known as the painter of Additional 15677. 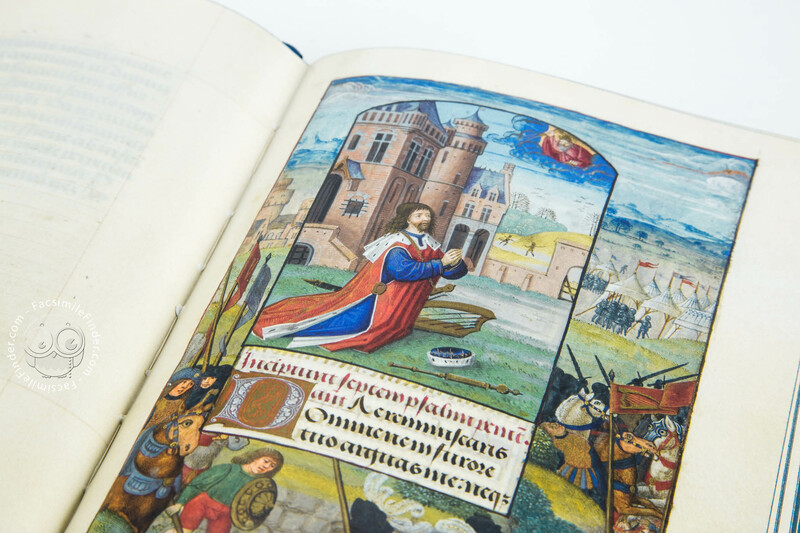 The other three artists have been identified as the Master of the Dresden Prayer Book, the Master of the Prayer Book of James IV of Scotland, and the Master of St Michael, named after one of the miniatures in the manuscript. Such collaboration would indicate the high status of the commissioner, who unfortunately remains unknown. 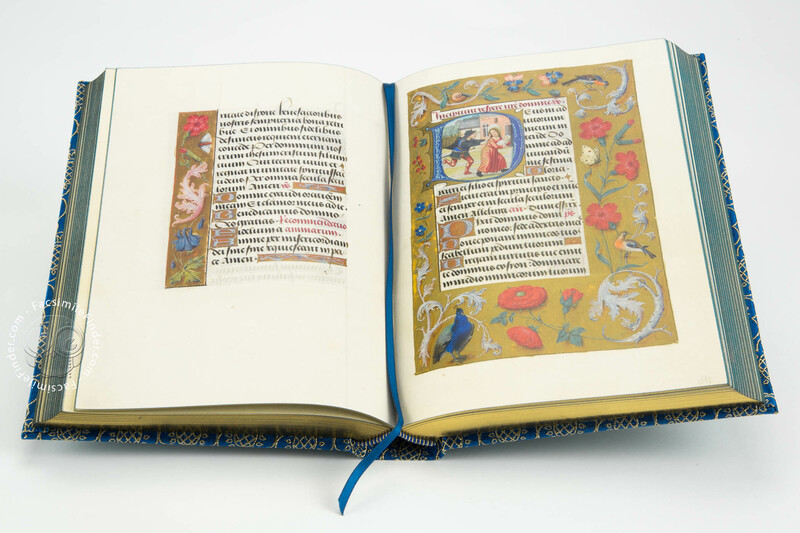 Most of the pages, according to the trompe l'oeil technique, feature insects, flowers and berries, all of which seem literally scattered over the manuscript's page thanks to their painted shadows. The borders are mostly natural but very much varied with wild carnations, roses, butterflies, birds, strawberries etc. Another decorative element are the decorated initials, many of which can be found on each page, delicately painted with curlicues in white, gold, and red on a shell-gold background. The script is an exquisite example of Gothic bastarda, a minuscule bookhand. Originated between France and the Low Countries, this script was widely used in the court of the Duchy of Burgundy, so much that it is also called lettre Bourguignonne. Typical of the script is the uncial d and the double looped s.
Unfortunately, the original binding has not surived with the rest of the manuscript. Currently, it features a red velvet binding with clasps, which is considered a 19th century's Victorian interpretation of the original one. 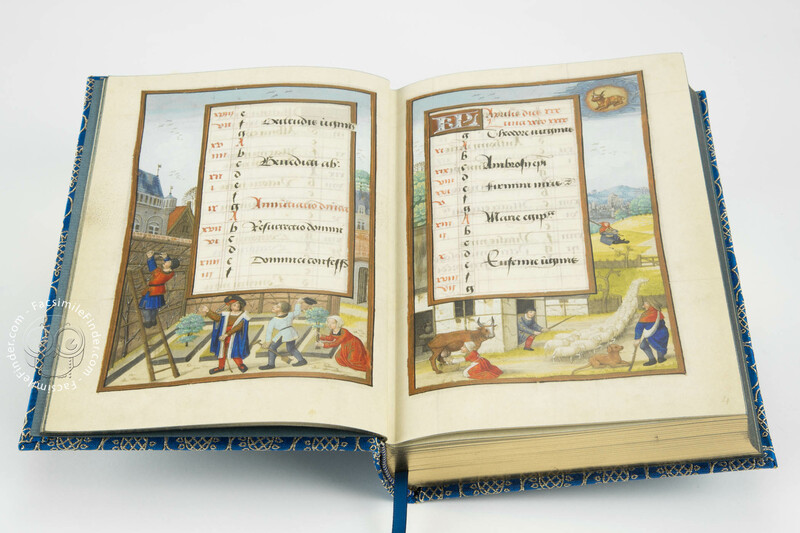 Manuscript book on parchment − 19.6 × 13.2 cm − 370 pp. 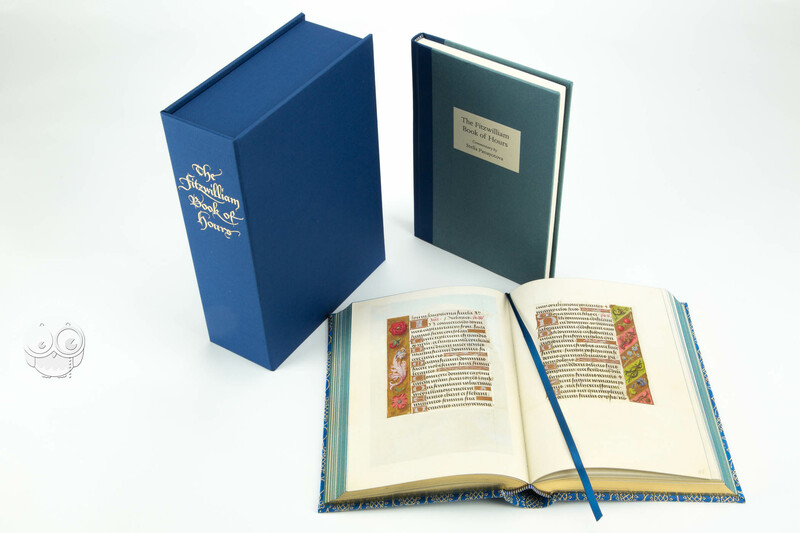 Full-size color reproduction of the entire original document, Fitzwilliam Book of Hours: the facsimile attempts to replicate the look-and-feel and physical features of the original document; pages are trimmed according to the original format; the binding might not be consistent with the current document binding. 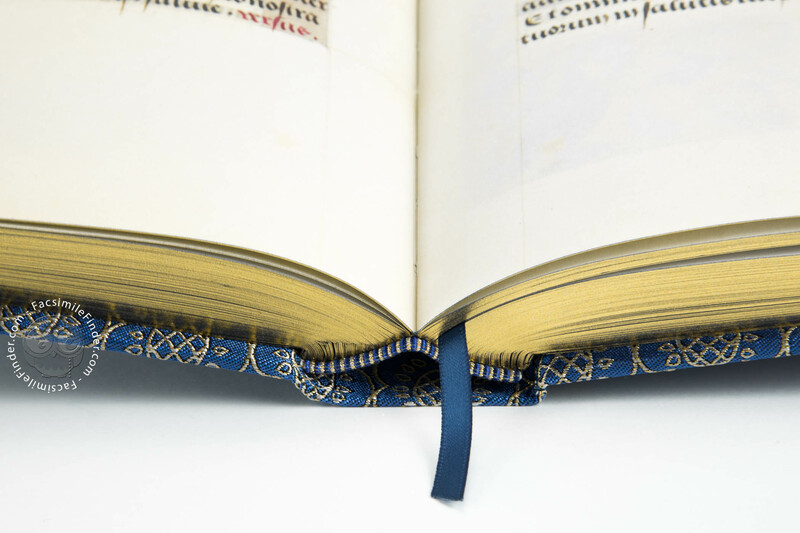 The manuscript was photographed by Andrew Morris, widely recognised as one of the leading manuscript photographers in the UK, who captured the incredibly detailed, fine filigree gold lines. 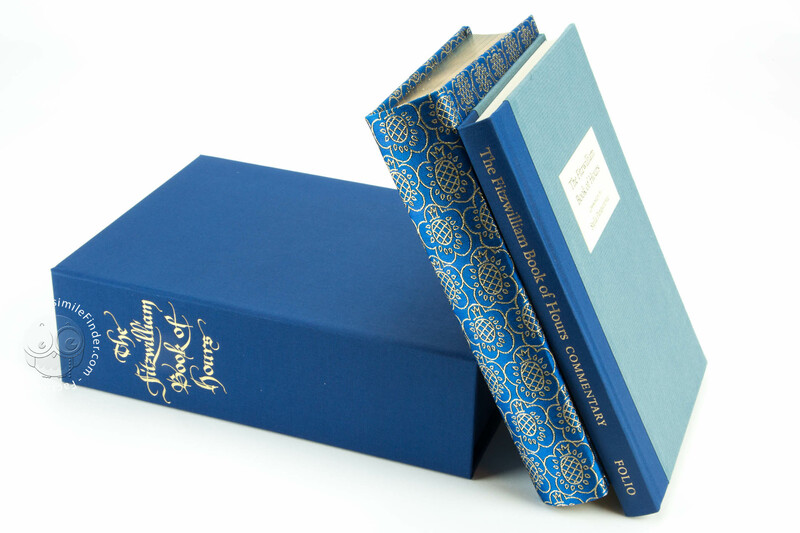 Printed by Beacon Press on Furioso paper with Hahnemuhle Bugra Butten endpapers. The paper has been specially selected for its similarity to vellum, and the rich colors of the gold, the deep blue and the pastel shades of the flowers glow on the page. 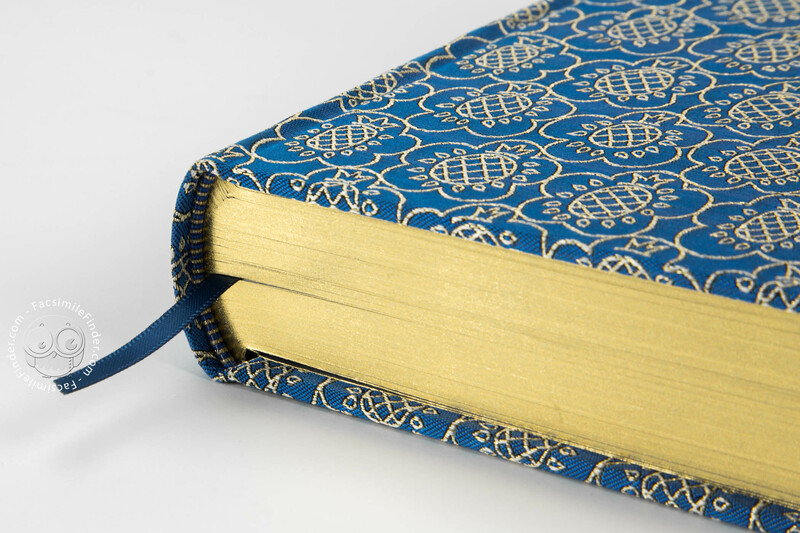 Before binding, the edges of the book are stained deep blue and then gilded, to give them a subtle patina. The books are then hand-bound. Facsimile edirtion presented in a cloth-bound solander box with gold blocking. 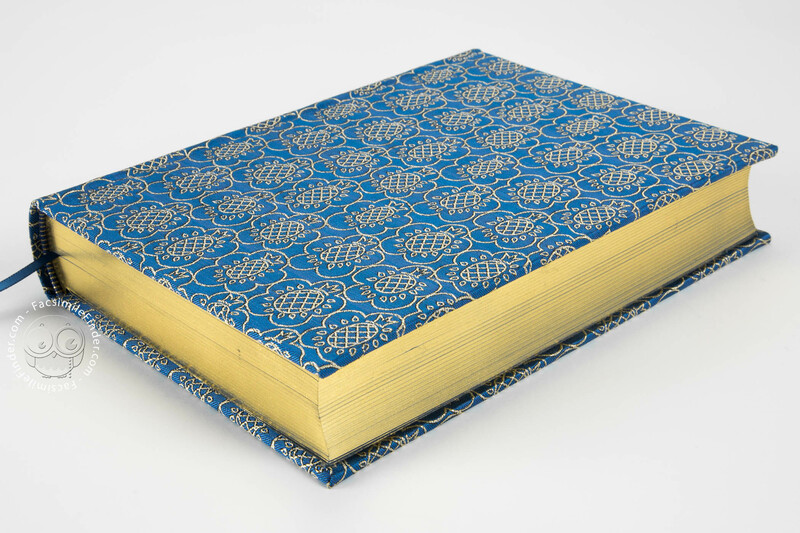 Sumptuous new binding created for this facsimile, using a pomegranate design present in several illuminations. The gorgeous fabric is a silk-woven jacquard embellished with gold weft, a mill originally founded by a Huguenot silk-weaver in the 1720s.